Table flask – Self explanatory. For use on a table inside or out. THESE Usually comes with a flat bottom a or sitting on 4 legs to keep it flat. 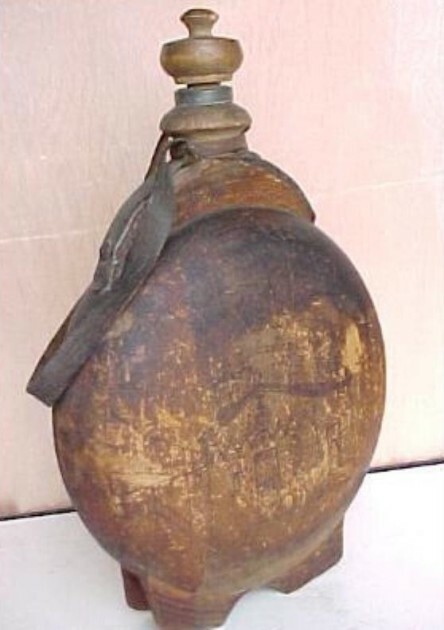 Some have hopss on both sides of the top of the body to be used aslo as portable as pilgrim’s flasks. 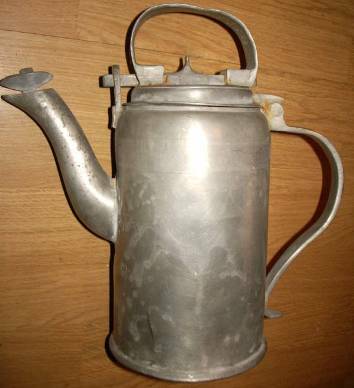 Tacked on (Added) – Steins that have had additions to the bodies or lids that are not original to the piece, There is one SCI member who lives in Florida who glues miscellaneous ‘dreck’ onto his steins and then shows” them off “at club meetings. I think “he is” a little off!! There is probably no faster way of decreasing a steins collectability short of hitting it with a hammer. 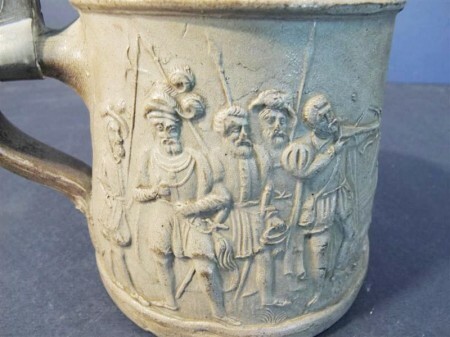 Tapestry stein – A form of decor on the stein body where the scene appears on a raised relief portion that looks like a piece of cloth (tapestry?) nailed to the body. 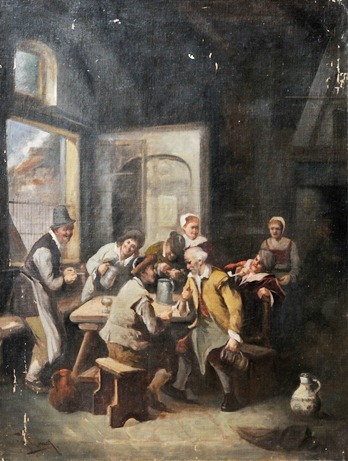 Shown: A V &B Mettlach, unusual scene. 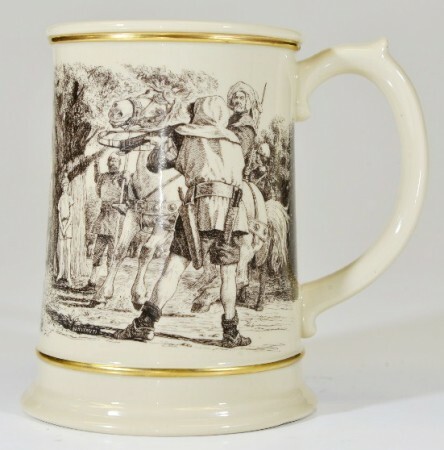 Tankard – By English and American definition, this is any drinking vessel equipped with a lid. (The English also apply this word to things like Lemon-aid servers.) 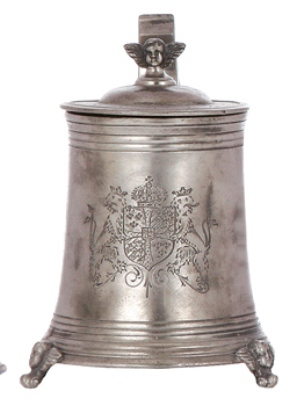 Shown: Sterling silver, dated 1928, but made in the 1700’s style. “Mugs” do not have lids! 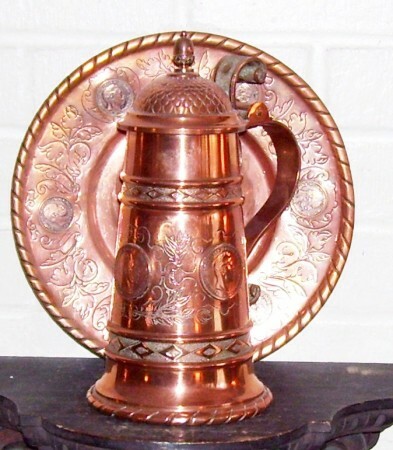 “Tankards” are called “steins” by USA collectors who collect primarily German/Austrian/Low Country, Russian and Scandinavian vessels. Also see: Stein, Lidless stein, and Mug. 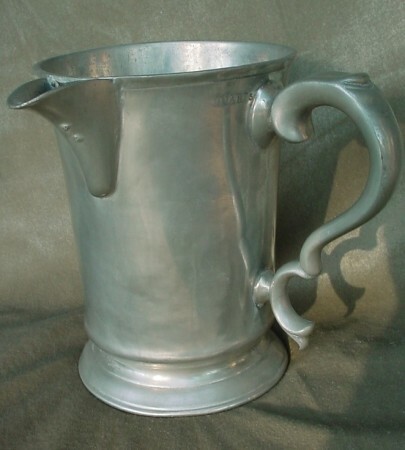 Tankard – Above – Lots of people call this style a tankard, when it should be called a flagon, which is a “liquid serving vessel.” Shown above: English wood and silver plated flagon. Circa 1880 -1910. 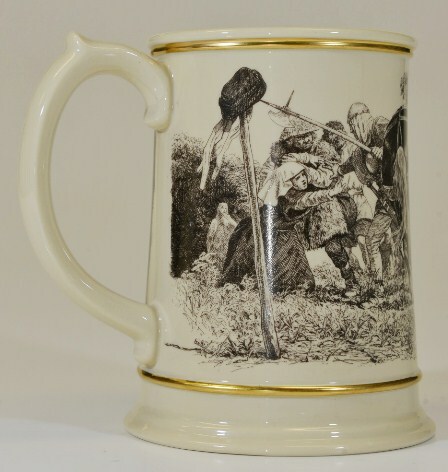 Ebay type sellers also have a hard time defining what they think is a tankard . 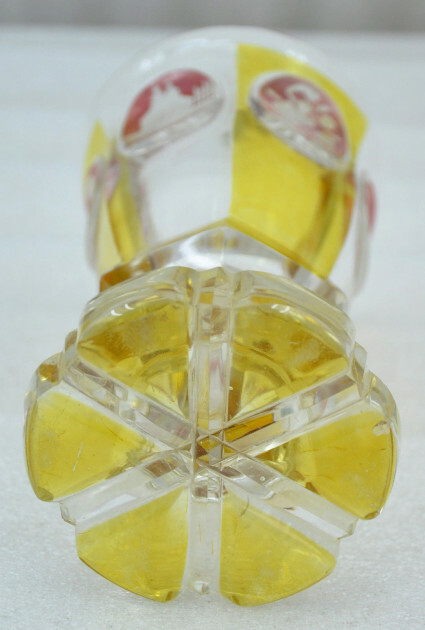 The above 3 inch tall shot glass or schnapps cup was called one. 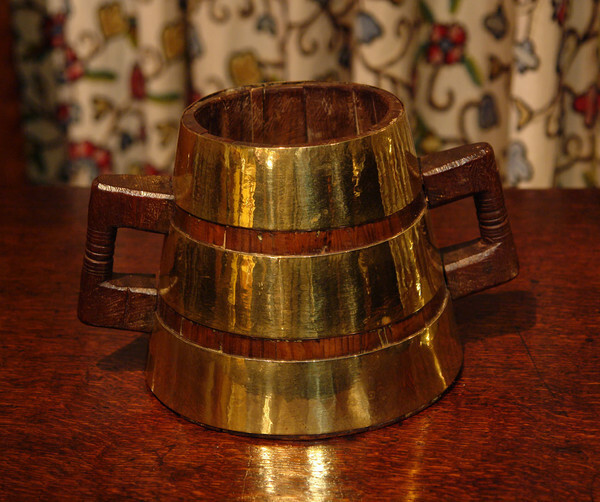 The way the handles are done is very reminisant of the older (1650-1800’s) European bronze mortars. 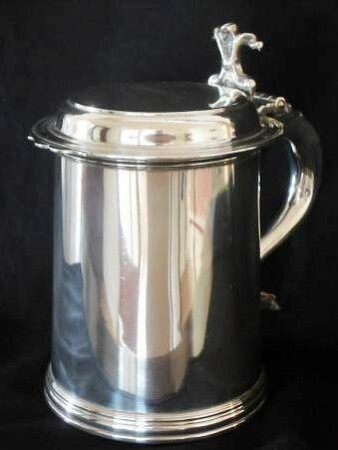 Tankard makers – Please refer to my good friend’s web site. 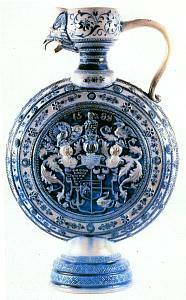 Chris Wheeler has done an amazing job in compiling information on most all makers of steins and tankards in Europe. And if your info is not listed, Chris will be more than wiling to help you out with any info he might have. Tannhäuser – A German Minnesänger and poet. Tanhûser; died after 1265.) Historically, his biography is obscure beyond the poetry, which dates between 1245 and 1265. Socially, he presumed familial lineage with the old nobles, the Lords of Thannhausen, residents in their castle at Tannhausen, near Ellwangen and Dinkelsbühl; moreover, the historical Tannhausen castle, is at Neumarkt in der Oberpfalz. Tannhäuser was an active courtier at the court of Frederick II of Austria (1230–1246), and the Codex Manesse (1340) depicts him clad in the Teutonic Order habit, suggesting he might have fought the Fifth Crusade (1213–21). 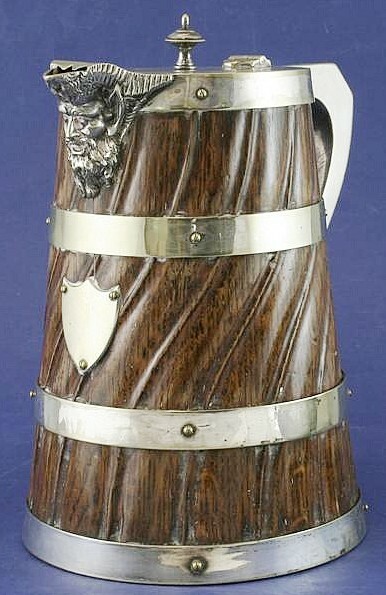 Tavern ale and beer server. 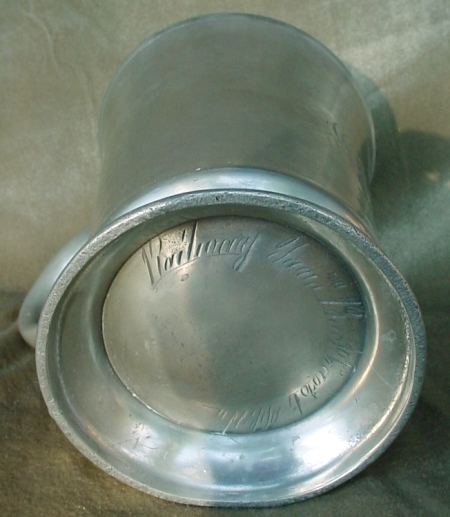 (English pewter ) – A lot of these pewter ale servers had the names of the taverns / inns engraved in an old script (hard to read) on the bottom of the piece. The one shown below carries London quantity verification marks. The People of Switzerland were not always free and happy as they are today. Many years ago a proud tyrant, whose name was Hermann Gessler, ruled over them, and made their lot a bitter one indeed. One day this tyrant set up a tall pole in the public square of Altdorf, and put his own cap on the top of it; and then he gave orders that every man who came into the town should bow down before it. But there was one man, named William Tell, who would not do this. He stood up straight with folded arms, and laughed at the swinging cap. He would not bow down to Gessler himself. William Tell’s home was among the mountains, and he was a famous hunter. No one in all the land could shoot with bow and arrow so well as he. Gessler knew this, and so he thought of a cruel plan to make the hunter’s own skill bring him to grief. He ordered that William Tell’s little boy Walter should be made to stand up in the public square with an apple on his head ; and then he bade William Tell shoot the apple with one of his arrows. Detail of William Tell shooting his arrow on the ‘Mud” stein above. The .5 liter V & B Mettlach version of the Tell legend. 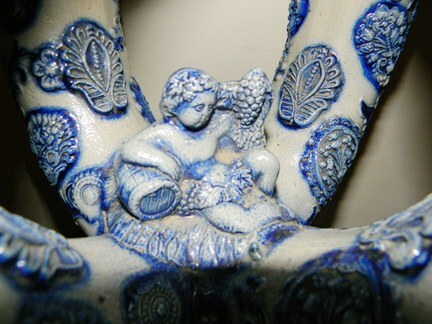 Franklin Porcelain’s entry into the fable. 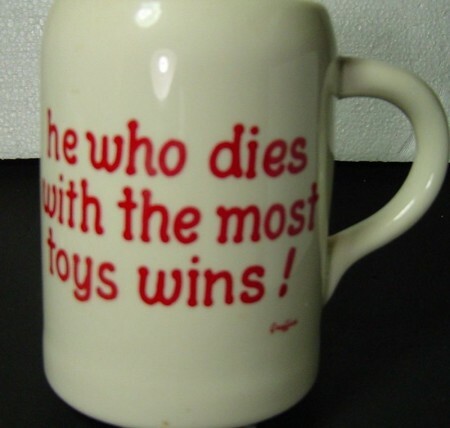 Made for Father’s Day – 1979. 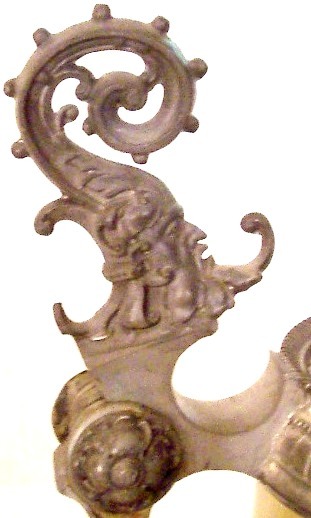 Tenn & Metallförädl Stockholm – F. SANTESSON’S (a Swedish Master Pewter-smith) second firm. 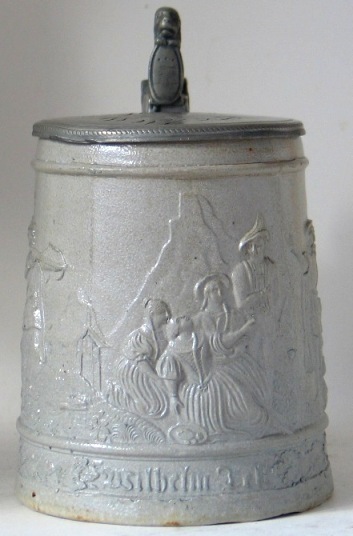 Tennis, Woman’s – Not too big a sport back then, so steins depicting thais sport are scarce. 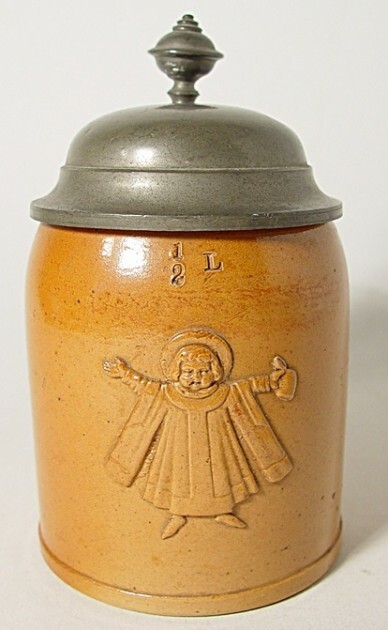 ▼ .5 liter stoneware, incised, Hauber & Reuther. No. 1002, circa 1900. 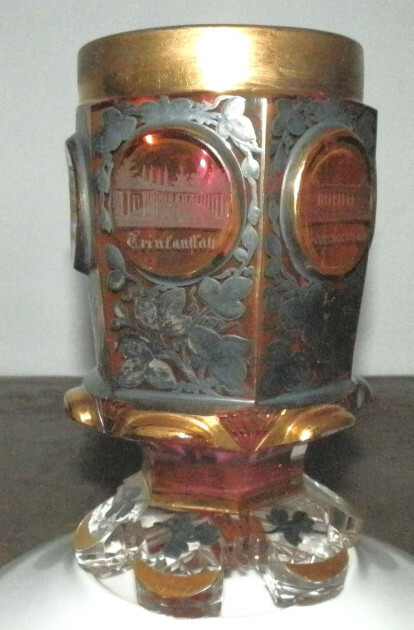 Teplitz – A small city in Bohemia in the mid 1800’s that produced very nice cut glass beakers. mostly found as spa cups today. 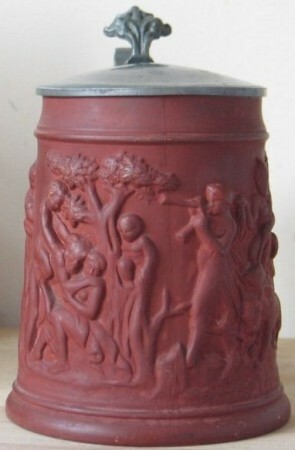 Also famous later Afor rt Nouveau pottery. Blown up Detail of spa beaker shown above, deep cutting on the base. 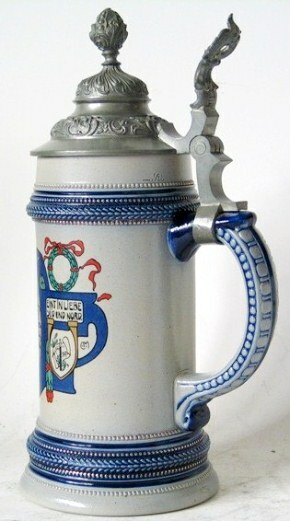 Teplitz is known for their great cutting on the based of their beakers and steins with set-on-lids. 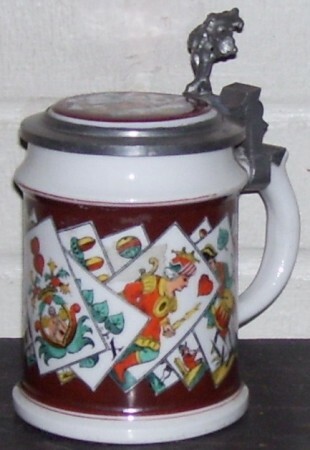 A Teplitz wheel cut set on lid beer stein.▲ It is doubtful this was used a for spa water as its size is about one liter, even though there appears to be cut spa scenes in the roundels. Relief, called terracotta. I am suspicious of all of them now since I bought the one above ▲ and it wasn’t Terracotta. For comparison purposes this is the true color of old European Terra-cota. Teutoberger wald – The woods and swamp in which the battle of 9 A.D. between Hermann and the Roman legions was originally thought to have been fought. 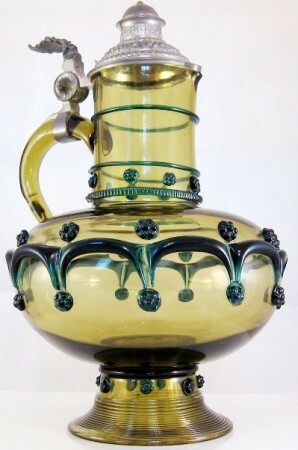 Thechterbeker – One of these above – From Siegberg, Germany. Circa 1500. 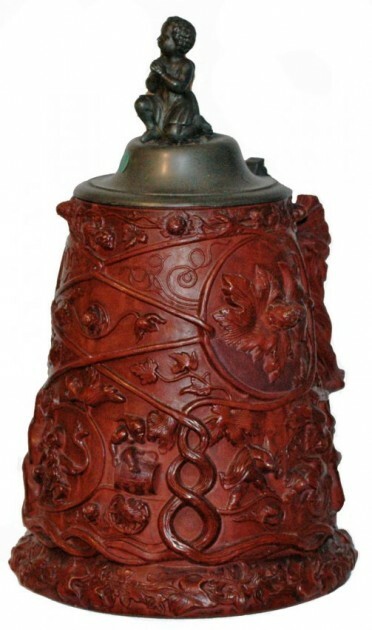 Thenn, Fritz – Maker of stoneware vessels in the Westerwald style, but located in Regenburg, Bavaria. Shown : Two wine / beer servers of salt glazed stoneware. Notice there are no rings in the grotesque’s mouths. 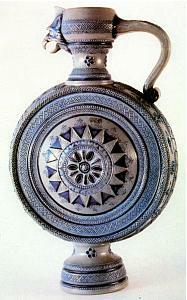 But the book Regenburger Steinzug shows both with stoneware rings, so these were possibly lost along the way. But the book shows both these models as having quality pewter lids added, so I must say I don’t know if these could be ordered without rings . See: http://www.thepatriotexchange.com/pss/infolnk2.htm. for much more detailed info. FROM SCI’S STEIN TALK ……. 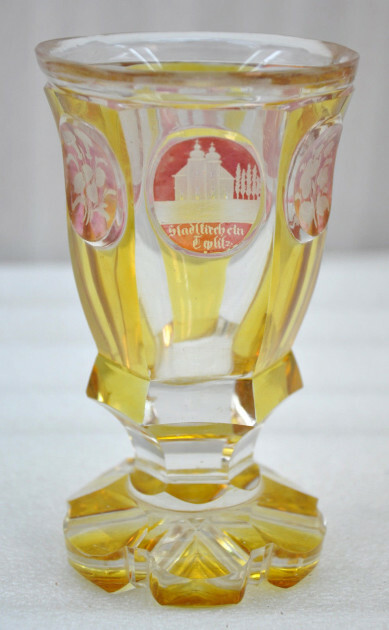 BY JOHN STRASSBERGER MARCH 2013: More information on the origin and production of so-called Regensburg steins is beginning to emerge. 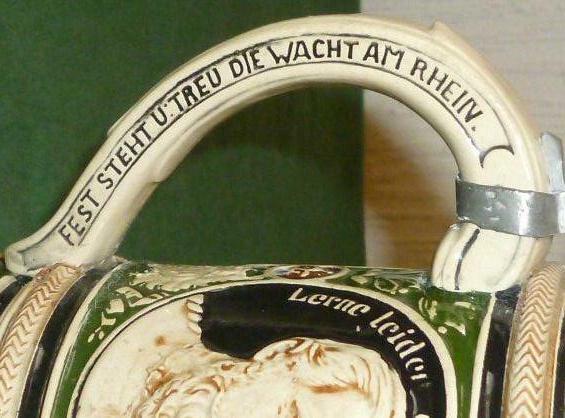 In 2011, there was an exhibition in Regensburg dedicated to the history of Regensburg stoneware, especially that of Fritz Thenn. A booklet was published to accompany the exhibit and George and Gabi Schamberger and I worked on translating it to English. The following is quoted from an essay in the booklet written by Werner Endres, entitled “Regensburg Stoneware – Unknown and Forgotten in the Oberpfalz”: “…But the process (pressed mold) led to an almost endless monotone form of slightly conical cylindrical vessels. The decorations of this specific production group can achieve no more than half-relief characters. 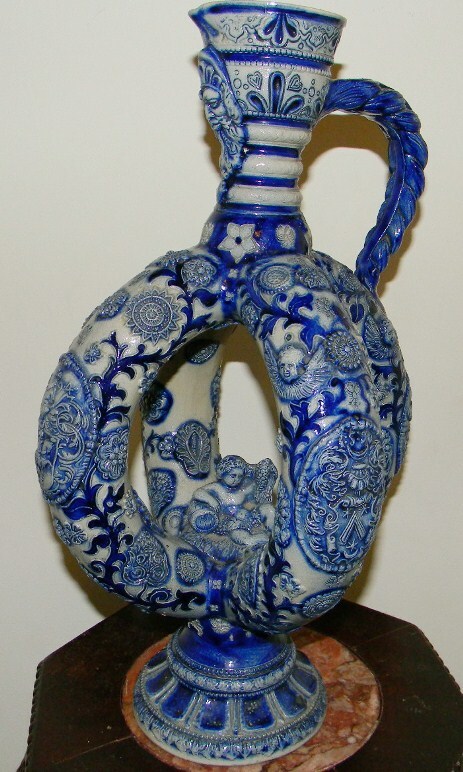 An oil was used to separate the stoneware from the metal mold, therefore these pieces could not be painted even with watery cobalt blue. 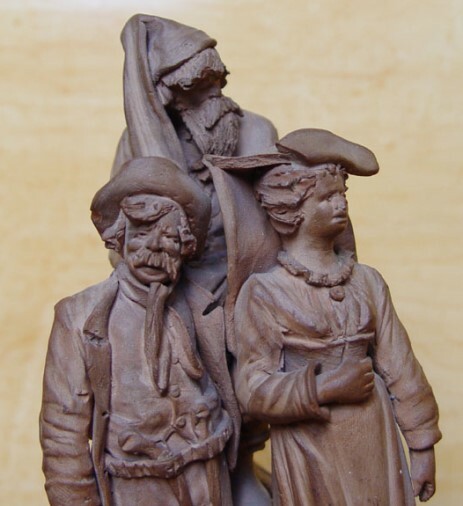 Nevertheless, the result, in comparison to the simple traditional scratch decorations of flowers, birds, or deer, the new decorations with many figures were very popular with consumers, especially in southern Germany. 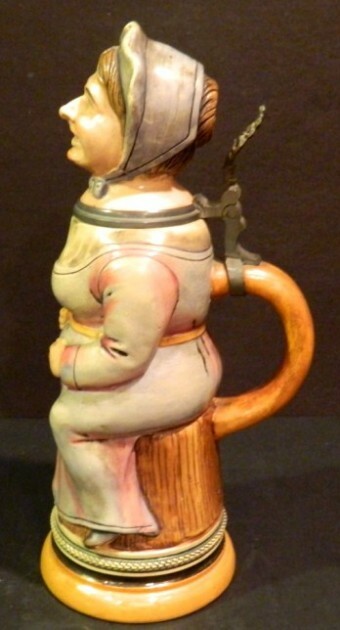 In antiques stores and trade shops the steins are known as “Regensburger Krüge”, even though seventy known designs of the “gepresste Kännchen” molds were made by Simon Peter Gerz, Merkelbach and Wick, Reinhold Hanke, Reinhold Merkelbach, Marzi and Remy and only nine were made by Thenn in Regensburg.” (Emphasis added) Later in the essay he writes, “It is worth mentioning, in part because of the local people and collectors, the misleading use of the name “Regensburger”. 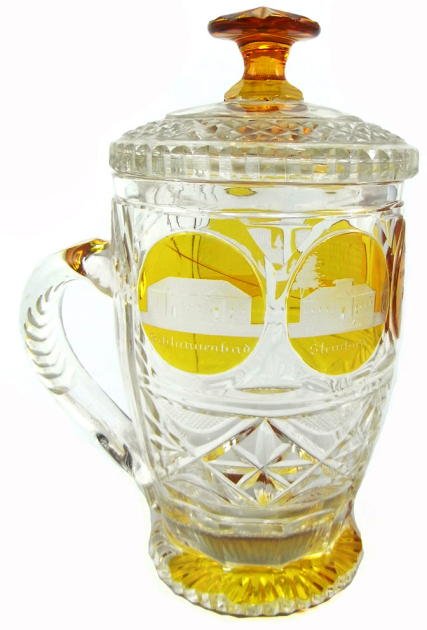 The lack of knowledge of the huge Westerwald production lead to the opinion that all the “gepresste Kännchen” steins called Regensburger came from Regensburg. This false impression is still present in auction houses and ebay to this day. 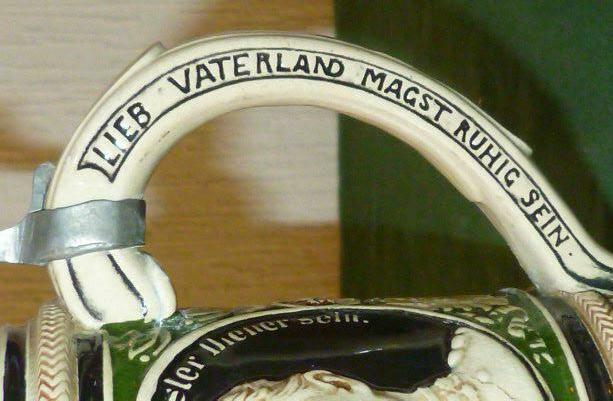 This is the first I’ve seen of production numbers showing the extent to which “Regensburg” style steins were made in the Westerwald. Unfortunately, Herr Endres did not provide clues to help us identify who made an individual piece. For those interested, George has copies of the booklet available. 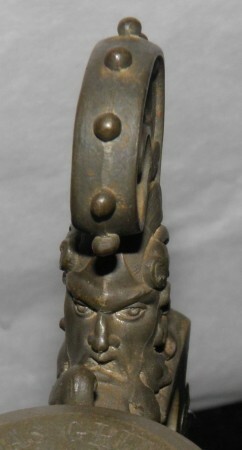 Below: A wonderful 16 inches tall Regenberger (Thenn= ??) 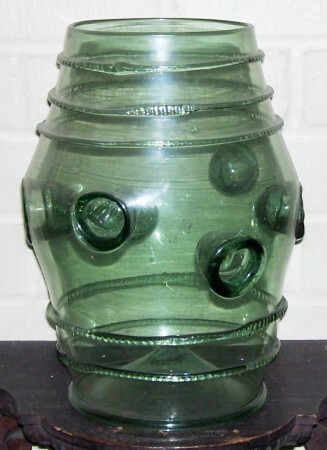 double ring” wine jug, with an added bonus of a small molded Bacchus by his wine keg in the middle. Mold number 73. Theresienthal glashütte – A medium sized but well known glass hut located in Bavaria, not Bohemia!. 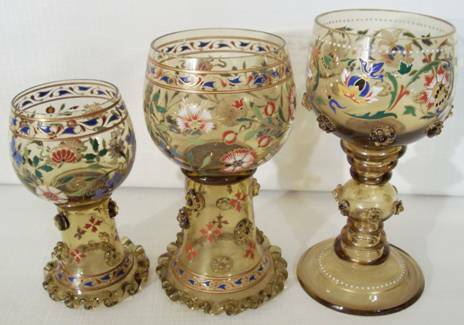 They made excellent enameled with gold lined flower designs on wines, beakers, steins, serving steins and roemers in the late 1800’s. 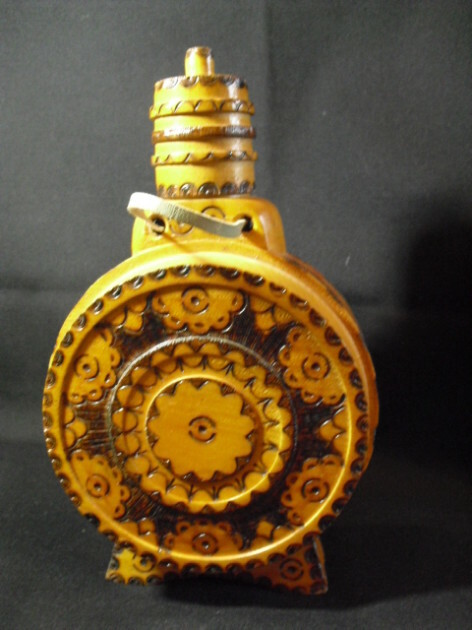 Those along with a multitude of other designs. Still in operation in 2000. 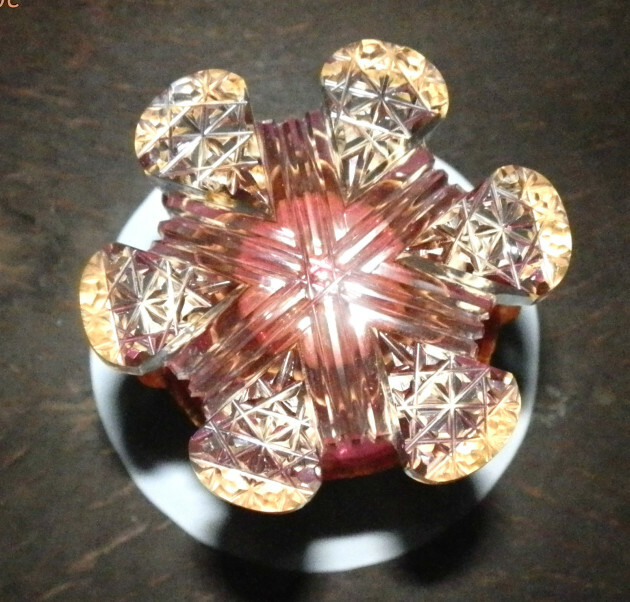 Some of the world famous Theresienthal enameled wine roemers. “The one with the most steins …….” Years ago that would have been Bill Schwartz’s (Lancaster, Pa.) honor. 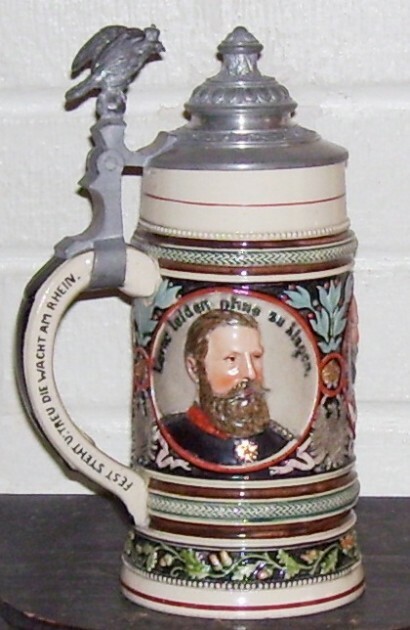 See: “Schwartz’s beer stein collection” in this site’s Compendium. 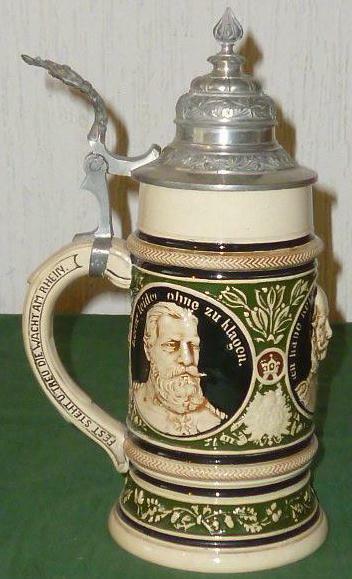 Thewalt, Alberto Jacob – A large German beer stein maker. Shown ▼: “Woman on a stump,” Character . .5 liter. Mold no. 488. 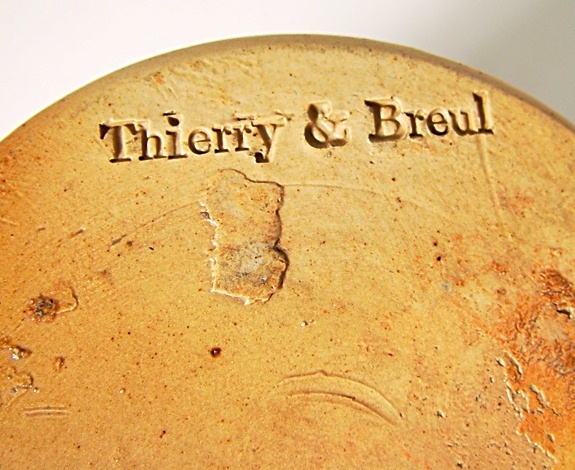 Thierry & Breul – Shown: A half liter stein made for the Munich market by Doulton and distributed by this firm. Ca. 1900. 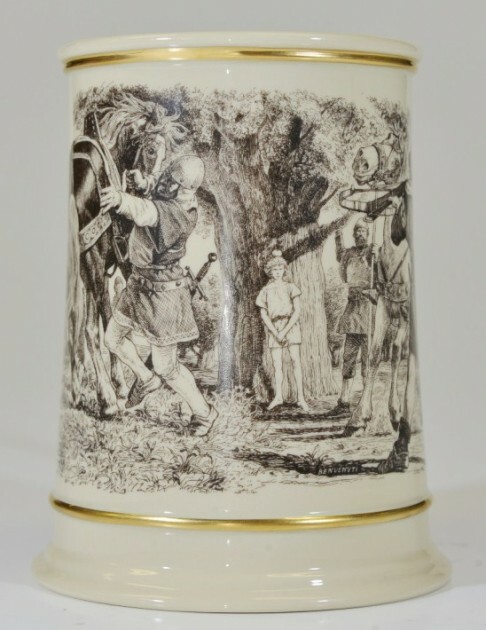 Shown: A “threaded relief” 2 liter pottery serving stein by Diesinger. Circa 1906. Detail of the Arms ▲. 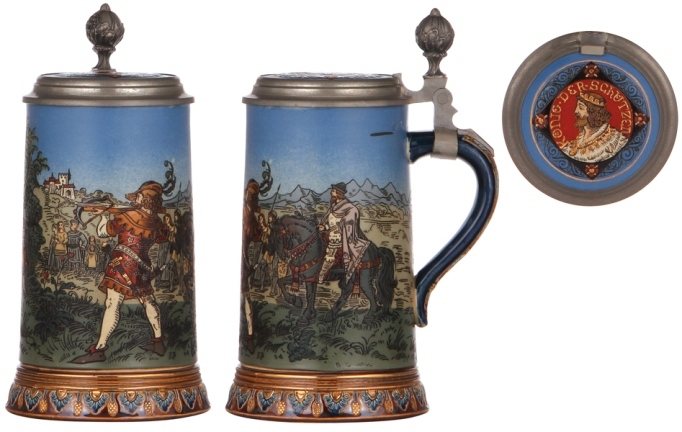 Also see:” Swedish steins” in this site’s Compendium. ▲Wilhelm II (1888–1918), during whose reign the monarchy in Germany ended near the end of World War I. 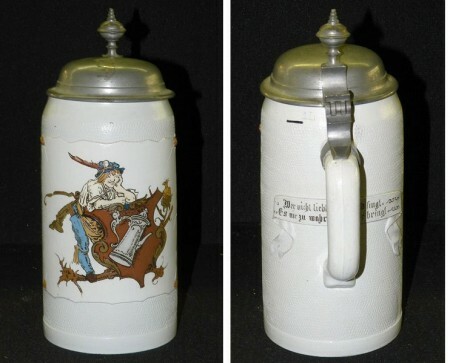 The firm that produced this stein [FWTD] also made a 2 liter master stein with the profiles in the opposite direction, and the variant shown just below ▼. 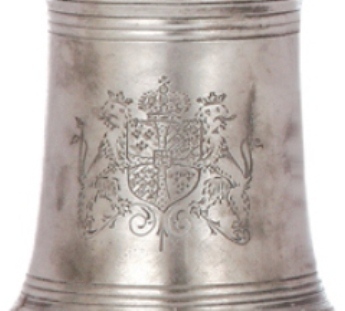 Details of wording on handles. ▲& ▼. Three Kaisers, The – The year of the three German Kaisers, 1888, was quite a year for the German aristocracy and one that sent Germany headlong into a disastrous course of events. For the uninitiated ‘Kaiser’ is the German title meaning “Emperor,” with ‘Kaiserin’ being the female equivalent to “Empress.” As the Russian “Czar”, “Kaiser” is directly derived from the Latin Emperors’ title of Caesar. 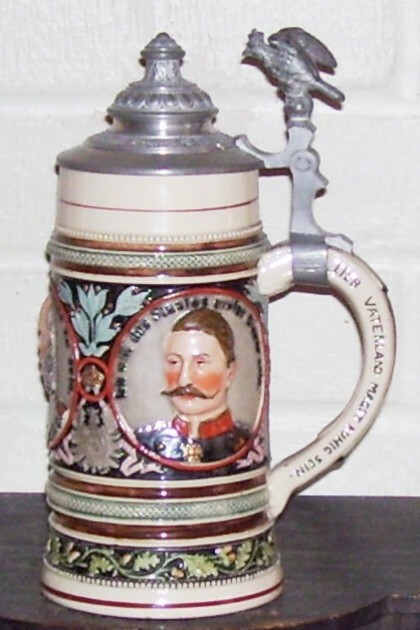 The Kaisers of the German Empire (1871–1918) [during which time most of the collectable German beer steins were produced] were: Wilhelm I (1871–1888); Frederick III (1888), who ruled for only 99 days; and Wilhelm II (1888–1918), during whose reign the monarchy in Germany ended near the end of World War I.
Thumblift – (American usage; the English word is “thumb-latch.”) A devise usually molded of pewter on most German pottery, porcelain and pewter beer steins, that when pulled back by use of the thumb will lift the lid of a drinking vessel. A study of the styles of thumblifts and their location on the lid or over the hinge will assist in identification of earlier pieces. 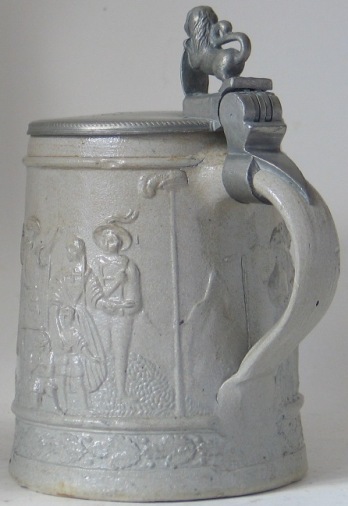 Figural thumblifts, eagles, gnomes, etc, appeared on common German steins as early as the as 1840’S and continued to about 1890. See: Ball, Urn, Character, Dwarf. Thuringian (Forest), (German: Thiiringerwald) – A range of hills in Germany, extending in an irregular line from the neighborhood of Eisenach in the N.W. to the Lobensteiner Kulm on the Bavarian frontier on the S.E. On the S.E. it is continued directly by the Frankenwald Mountains to the Fichtelgebirge, while on the N.E. it approaches the Harz Mountains, and thus takes its place in the great Sudetic chain of central Germany. 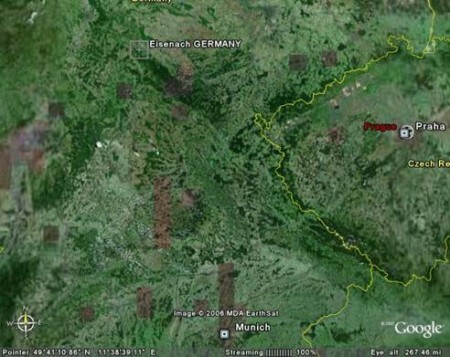 The length of the Thuringian chain is 70 m., and its breadth varies from 6 to 22 m.
Thurnau – A municipality now in the district Kulmbach, Germany. It is known for golfing as well as its potteries.